LAHORE: (Tuesday, March 13, 2018): Punjab University Institute of Agriculture and Research has launched a research project to provide unpolluted, fresh and organic vegetables to citizens. 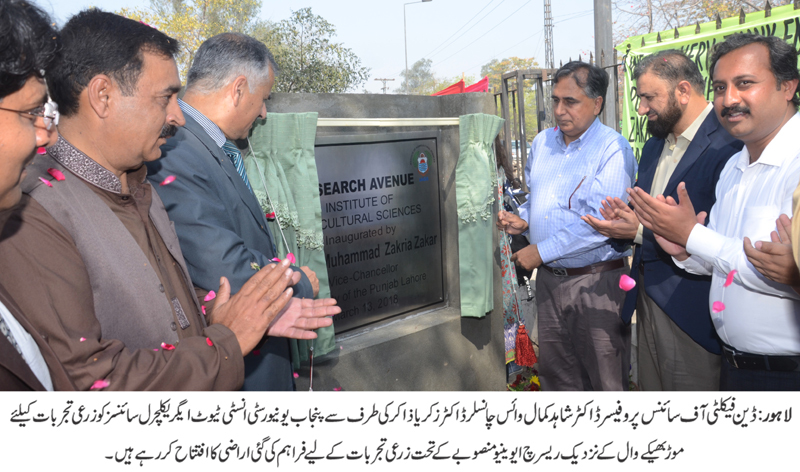 On the directions of PU Vice Chancellor Prof Dr Zakria Zakar, a piece of 21 Kanal land situated at Mor Bhekewal has been handed over to IAGS for its project “research avenue” for the purpose. In this regard, an inaugural ceremony was held in which PU Dean Faculty of Science Prof Dr Shahid Kamal, Dean Faculty of Life Sciences Prof Dr Naeem Khan, Director IAGS Prof Dr Muhammad Saleem Haider, Prof Dr Anjum Nasim Sabri, Prof Dr Nasira Jabeen, Registrar Dr Muhammad Khalid Khan, Acting Treasurer Rao Muhammad Sharif, RO-II Mallik Muhammad Zaheer, RO-I Choudhary Iftikhar, Saeed Mughal, faculty members and students were present on the occasion. In his press statement, PU Vice Chancellor Prof Dr Zakria Zakar said that the fruit of research work being carried out at universities must reach the society. He said that PU would play its role for resolving issues being faced by the masses as it is one of the basic purposes of universities. In his address, Prof Dr Saleem Haider said that the institute had aimed at providing organic and fresh vegetables to the people. He said that people would also be provided with training on kitchen gardening under comprehensive training programs. Prof Dr Shahid Kamal and Prof Dr Naeem Khan lauded the efforts of the institute and said that such efforts would help people sensitize on unpolluted vegetable and they would be able to benefit from the research project. Later, the participants planted trees.